Book Synopsis: Fans of Australian writing (not just crime fiction) if you’ve not caught up yet with Rowly Sinclair and his wanderings through 1930’s Sydney and beyond, where on earth have you been? In my review of the first book – A FEW RIGHT THINKING MEN – I did comment something along the lines of there being just a little more history than mystery at points, but that balance has been elegantly sorted out in the second book. Not to say that the history suffers here either – the research that goes into the background of these books is fantastic, but the story-telling is even better. In A DECLINE IN PROPHETS Roly and his band of supporting artists and bohemians have been off around the world, but the action of the book mostly takes place on the RMS Aquitania – giving a very believable closed room setting. Both on ship and on land, there’s a good range of puzzles and mysteries, a good dose of the relationships between Roly and his friends, and as an added extra a lot of Roly and his family when the travellers eventually return home. The great thing about these books is that you can really see them appealing to lots of different reader’s preferences – the historical period is wonderfully evoked, the action is strong but there’s no overt sense of thriller going on. The deaths are believable, but the scenes described with sufficient detail to give the reader a sense of what is happening, without any gore or sensationalism. There’s a touch of romance, just the slightest bit of unrequited relationship between Roly and sculptor and companion Edna but not enough to make me throw my hands in the air and scream not again! There’s also a great cast of the slightly eccentric through to flat out mad as a hatter types all of whom serve their part in the cast without raising any sneaking sense of affect. What really sticks in my mind about A DECLINE IN PROPHETS is that it’s just flat out, great story telling. Good characters, a believable plot, both of which transport the reader to a place and a time that just feels right. 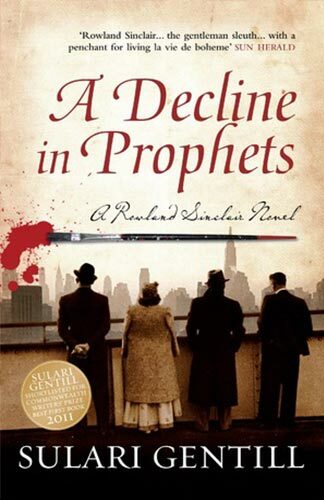 Regardless of your preference in crime fiction, lovers of cozies, procedurals, historical or current day settings, A DECLINE IN PROPHETS is just a fantastic book.